We All Scream ← You Want Me To Wear What? 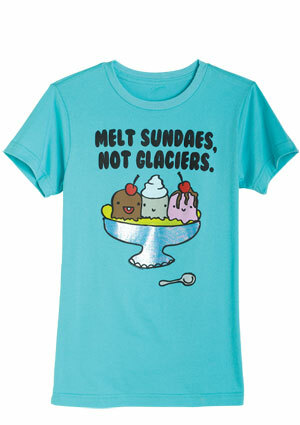 “Melt Ice Cream, Not Glaciers” will not be one of them. Let’s deal with the obvious, glaring error in this statement: no one should ever let ice cream melt. Ever. Unless you’re six and you still find “soupy” ice cream a novelty. I’m not saying that letting ice cream melt is a catastrophe on the level of global warming, but … no, that’s exactly what I’m saying.